A balut (spelled standardized as balot) is a developing bird embryo (usually a duck or chicken) that is boiled and eaten from the shell. It originates and is commonly sold as street-food in the Philippines. They are common food in countries in Southeast Asia, such as Laos (khai look ໄຂ່ລູກ in Lao), Cambodia (pong tia koun ពងទាកូន in Cambodian), Thailand (Khai Khao ไข่ข้าว in Thai) and Vietnam (trứng vịt lộn or hột vịt lộn in Vietnamese). They are often served with beer. The Tagalog and Malay word balut means "wrapped". The length of incubation before the egg is cooked is a matter of local preference, but generally ranges between 14 and 21 days. The eating of balut is controversial due to religious, animal welfare and human health concerns. Balut is a fertilized bird egg (usually a duck) that is incubated for 14 to 21 days, boiled or steamed, and the contents eaten direct from the shell. In balut that has been incubated for longer periods, the embryo is well developed and the features of a baby duck are recognisable. The partially-developed embryo bones are soft enough to chew and swallow as a whole. The mallard duck (Anas platyrhynchus), also known as the "Pateros duck", is considered to be the most important breed for egg production to make balut. In the Philippines and other localities where balut is a traditional food, it is a common street-food and is also sold in stores and malls. It is a substantially higher source of protein and calcium compared to a regular unfertilized egg, and it is relatively cheaper. The Philippines were influenced by the Chinese around 1885, and since then, balut has been included as a traditional part of the culture. Wherever Filipinos migrated around the country for work, a large market of balut would develop. Controversies arose as knowledge of the food spread around the South East Asian countries and then globally. People questioned the ethics of eating the food. Traditionally, the fertilized eggs are incubated in the sun or buried in sand, and stored in baskets to retain warmth. After nine days, the eggs are held to a light to reveal the embryo inside. The production of balut depends on egg maturation cycles, where the egg begins developing and changes in texture. Throughout these various maturation periods, different temperatures are required to accentuate the specific egg and embryo characteristics. Within the first few stages of maturation, balut is known as "balut sa puti" ("wrapped in white") where it is white; the embryo inside is insufficiently developed to show a beak, feathers or claws, and the bones are undeveloped. These are made from very specific egg types, less than five days old and with no visible surface cracks. During the cooking process, changes occur in the food chemistry of balut. During the cooking process, when a broth-like liquid appears at the top, it can be considered a sol dispersion, a suspension of large molecules within a liquid, generally water. The liquid is the broth and embryonic fluid, whereas the solid are the parts of the duck within the egg, sometimes separates and partially floating within the liquid. Another dispersion present within balut is an emulsion. 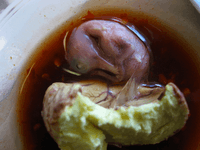 Although balut is mainly made up of protein, fat is present within the fertilized bird. An emulsion is a suspension of liquid droplets (fat or water) within a liquid solution (fat or water). The broth found inside balut is a dispersion because of the liquid fat floating within the broth, this can also been seen in chicken broth, in chicken noodle soup. After cooking it can be considered a protein gel (depending on the length of time it was cooked for). Heating foods high in protein such as a chicken egg, or balut, can cause the chemical changes to take place and fully or partially denature proteins, causing the surface to become thick and essentially causing an irreversible gel protein formation to take place. In order for the embryo to develop normally, it must be exposed to the heat in incubation for a correct period of time, while ensuring that the temperature is not too hot to harm the eggs or too cold to prevent growth. The embryo is very sensitive to high temperatures, and is killed easily upon cooking in sun or by boiling within the traditional production methods of balut. It appears that temperature has a huge impact on the final taste and texture of the cooked balut. Warm temperatures (29-30 °C) changes the taste and texture of the yolk, for example making it more grainy. This can be attributed to the changes in proteins (and partial denaturation of proteins) with the heating and incubation process. Physical and chemical changes in the final balut product can also be attributed to microbial infections and the rate that microbes can infect the balut at various stages. For example, while cooking and storing balut, it appears that at low temperatures (such as refrigeration) and high temperatures (29-30 °C) do not promote the growing of microbes as much as room temperature would. If microbes were to infect the balut, either during cooking or during storage, this can have consequences on the chemical changes of the product, possibly reducing its nutrient value, its texture, and its quality. Besides intentionally buying an egg with an embryo, most of the time, eggs are very closely monitored to not have any development of an embryo present (meaning they did not come into contact with a male duck and are not fertilized). Instead, with balut, consumers want an embryo and a fertilized baby duck egg to enjoy. While we can cook normal chicken eggs, without an embryo by boiling them, we can also cook balut by boiling. When boiling or cooking eggs, the white of the egg tends to solidify, as the proteins are denatured in an irreversible reaction and turn from a transparent color into white. 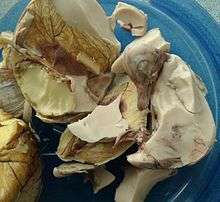 This is why cooking balut takes a lot of skill, since it is a very rich source of protein, cooking it can easily denature the proteins and cause undesirable, irreversible reactions. While balut can be cooked a number of ways, it is most common to boil eggs after fertilization and incubation. There are many chemical changes that occur inside the duck egg as it is being processed, and these changes can vary depending on how or what the duck egg is cooked with. While boiling, salt can be added which can contribute a number of chemical changes in the duck egg as it is being cooked into balut. Adding salt during cooking time seems to increase the weight of proportion that is the egg white within the shell. This can be due to the weight differences between the embryo and the egg white itself. Next, it was found that adding salt during cooking can increase the hardness of the egg yolk and affect the overall texture of the final balut product. Other chemical changes that are observed in nutrient content of the duck egg as it is processed as a slight decrease in the amount of available amino acids, water-soluble vitamins and minerals after the processing is complete. In the Philippines and Southeast Asia, balut is a common food that people eat. 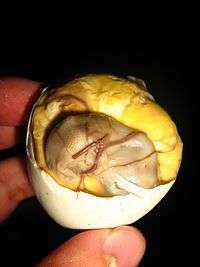 Balut is a fertilized chicken or duck egg with an almost developed embryo. The egg will be eaten in the shell once it has been boiled. There are different nutritional facts about balut since it can be either fertilized chicken or duck eggs. 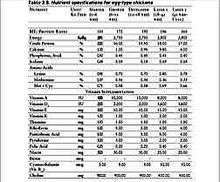 However, the nutritional data for chicken egg balut or duck egg balut are almost the same. In general, balut nutrition specifications between chicken and duck have minor differences. Both eggs have around 14 grams of crude protein, 188 calories each, and around 100 milligrams of calcium. A duck egg might have a higher value of nutrition than a chicken egg but overall, both chicken and duck balut have around the same nutrition value. In the Philippines, balut eaters prefer salt and/or a chili, garlic and vinegar (white or coconut sap) mixture to season their eggs. The eggs are savored for their balance of textures and flavors; the broth surrounding the embryo is sipped from the egg before the shell is peeled, and the yolk and young chick inside can be eaten. All of the contents of the egg may be consumed, although the white albumen may remain uneaten depending on the age of the fertilized egg. This white albumen may have an unappetizing cartilaginous taste and is tough and rubbery in texture. In the Philippines, balut have recently entered haute cuisine by being served as appetizers in restaurants, cooked adobo style, fried in omelettes or even used as filling in baked pastries. In Vietnam, balut are eaten with a pinch of salt, lemon juice, plus ground pepper or ginger and Vietnamese mint leaves called rau răm. In Cambodia, balut are eaten while still warm in the shell and are served with nothing more than a little garnish, which is usually a mixture of lime juice and ground pepper. A similar preparation is known in China as maodan (Chinese: 毛蛋; pinyin: máo dàn; literally: "feathered egg"), modan (Chinese: 末蛋; pinyin: mò dàn; literally: "end-stage egg"), wangjidan (Chinese: 旺雞蛋; pinyin: wàng jīdàn; literally: "flush egg") or huozhuzi (Chinese: 活珠子; pinyin: huózhūzi; literally: "living bead"). Chinese traders and migrants are said to have brought the idea of eating fertilized duck eggs to the Philippines. However, the knowledge and craft of balut-making has been localized by the balut-makers (mangbabalot). Today, balut production has not been mechanized in favor of the traditional production by hand. Although balut are produced throughout the Philippines, balut-makers in Pateros are renowned for their careful selection and incubation of the eggs. Vendors sell cooked balut from buckets of sand (used to retain warmth) accompanied by small packets of salt. Uncooked balut are rarely sold in Southeast Asia. 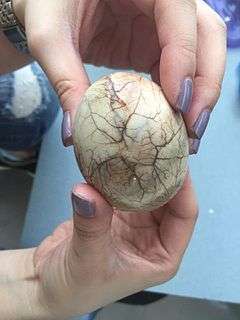 In the United States, Asian markets occasionally carry uncooked balut eggs. Alternatively, they can be mail-ordered. The cooking process is identical to that of hard-boiled chicken eggs, and baluts are eaten while still warm. Duck eggs that are not properly developed after nine to twelve days are sold as penoy, which look, smell and taste similar to a regular hard-boiled egg. In Filipino cuisine, these are occasionally beaten and fried, similar to scrambled eggs, and served with a vinegar dip. Balut is consumed in high amounts in countries in Southeast Asia; including Laos, Cambodia, Vietnam, Thailand, Philippines, China. Pateros is a first-class municipality in Metro Manila, Philippines and is famous for a duck-raising industry and producing balut. Balut is recognized as Philippines’ food, but possibly originated from China - it is said that the origin of balut was brought by Chinese traders and migrants to Philippines, as the Chinese may have sparked the interest and excitement for the Philippines' love of balut. It is commonly sold as street food and recently served as appetizers in restaurant, with a taste similar to chicken soup, but a texture quite like any other. Balut is found in some countries and locations of North America. While it cannot be found in every store in North America, specialty stores such as T&T, and particular Filipino stores in the Greater Vancouver location often sell balut. In the United States, Some special farms, such as Metzer Farms specialize in balut production, spreading the knowledge of balut and its awareness. 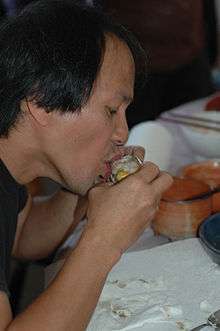 A reason it may not be found and consumed as frequently in North America as it is in special countries of its origin is that the majority of people outside of Southeast Asia still recognize balut as novel and taboo food and often, are scared to try it, as it is still an uncommon food to many people. In the Philippines, it is traditionally preferred to eat balut eggs with salt and/or a chili, garlic and vinegar (white or coconut sap) mixture to season, depending on personal preference. Balut is cooked adobo style, fried in omelets or even used as filling in baked pastries. 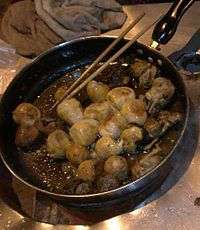 Balut can be cooked in many ways, although traditionally as an adobo style, it can also be cooked, boiled and fried, alone or with some other ingredients. Some countries and locations will serve balut raw, although not common. As well, it is important to note that ‘raw’ can mean just a light boiling or very light, brief cooking method. This is not the best choice as it is very susceptible to microorganisms. A huge reason why balut is required to be cooked for a specific time is to preserve it, and decrease the consumers susceptibility to disease. Although balut is globally recognized as a Filipino food, it is being consumed less and less in the Philippines. This is partly due to increasingly Western tastes, but also because balut is often associated with poverty. According to many people in Southeast Asia countries where in balut consumption is high, balut is believed as a folk medicine, a stimulator of sexual drive, and a traditional hangover cure. Such belief may be due to its high and extra value of nutritions. Men usually eat balut for sexual stamina and believe so. On the other hand, women usually eat balut due to its high value of nutrients. Because of this folk medicine-like belief, many pregnant women eat it; actually balut has high calcium levels and extra nourishment. These food beliefs and actual facts about balut have led the food so popular that it is recently served as appetizers in some restaurants in Southeast Asia countries. Balut egg purchased from local Vancouver, Chinese supermarket. Showing different labeling requirements than traditional Chicken Eggs. Balut is considered to be a street food, and as with many street foods, ideally, balut should be eaten as soon as it is prepared. Sources suggest that at most, the shelf-life of a cooked balut is one day, but can be kept in the refrigerator for up to one week. According to the FDA Food Code, balut can perish over time or due to temperature changes. After being cooked, balut should be handled either at 57 °C and above, or kept at 5 °C. While most countries have specific regulations and standards for food, Canada has certain egg regulations pertaining to what products can be labelled as an egg. Balut eggs are not subjected to the egg regulations in Canada under the Canadian Food Inspection Agency, meaning they do not require the specific labeling requirements and rules of the traditional chicken egg. Eating balut raises concerns for some religious groups. Part of the Quran, the Islamic religious book, includes understanding and respecting the law that any animal products should not be eaten if the animal has not been slaughtered properly, making the animal or animal-product "maytah". Because balut is an egg containing a partly-developed embryo, Muslims believe this makes it "haram", or "forbidden". Information relating to whether boiling a partially-developed embryo is ethically acceptable or not can be found in the legislation relating to the euthanasia and treatment of research animals. Bird embryos that have reached greater than 50% of their incubation have developed a neural tube sufficient for pain perception; therefore, they should be euthanized by similar methods used in avian neonates such as anesthetic overdose, decapitation, or prolonged exposure to carbon dioxide. Similarly, in the UK, embryonic birds are "protected animals" once they have reached the last third of their incubation period. There are specified methods of humanely killing protected animals used in research, but boiling is not one of these. Depending on the species of duck, some eggs used for balut would be boiled within the last half or third of embryo development. The RSPCA Australia recommends against boiling the duck embryo from the 18th day of incubation onwards due to the potential for suffering beyond that point, and notes that it is "an area that is yet to be further researched". Several groups wish to ban balut. A petition has been raised to get 5,000 signatures to have balut labeled "fertilized duck egg with embryo" and taken off the menu in the Maharlika restaurant, New York. (As of 2014, the restaurant was selling the embryos for $5 each.) As a response to this petition, Filipino New Yorkers have created a counter petition asking to leave the food item alone. The incubation temperatures and environment required for the proper development of balut during processing are ideal growth conditions for many bacteria including Salmonella enteritidis. In addition, faecal pathogens can be deposited on the egg shell surface during laying. Balut, is therefore labelled as a "Hazardous Food" in Canada. 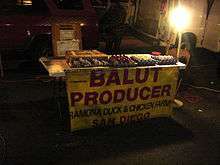 Warnings have been published to obtain balut only from safe, well known producers. Outside of Southeast Asia, balut is often considered a novelty and/or taboo food that has been featured on reality television shows, such as in season 1 of Bizarre Foods with Andrew Zimmern, or as part of eating challenges, such as on Fear Factor in 2002, Hell's Kitchen in 2013, The Amazing Race Australia 2 and The Amazing Race Ukraine, Survivor: Palau, Survivor: China, Survivor: Caramoan, Survivor: Cambodia, and Good Mythical Morning. 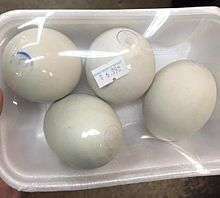 In the United States, these eggs are sold at Asian or Vietnamese markets. However, to get the right age eggs and to ensure freshness, it is recommended that they be purchased from a professional or an egg vendor at Asian farmers markets. Phillipe Nover of Team Nogueira ate balut during Season 8 of The Ultimate Fighter, encouraging his team mates to do the same. According to popular Vietnamese belief, these eggs are a nutritious and restorative food for pregnant or delivering women. ↑ Romjali, E.N. ; Lambio, A.L. ; Luis, E.S. ; Roxas, N.P. ; Barion, A.A. (2014). "Fertility and hatchability of eggs on mallard ducks (Anas platyrhynchos L.) of different plumage pattern under different feeding regimes". JITV. 19 (3): 674–678. 1 2 3 4 5 Magat, Margaret (January 1, 2002). 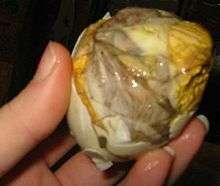 "Balut: "Fertilized Duck Eggs and Their Role in Filipino Culture"". Western Folklore. 61 (1): 63–96. doi:10.2307/1500289. JSTOR 1500289. ↑ Matejowsky, T. (2013). "The incredible, edible balut. food, culture and society". International Journal of Multidisciplinary Research. 16 (3): 387–404. 1 2 Liedel, E. (April 14, 2014). "Balut: The fertilized duck egg street snack". Modern Farmer. 1 2 "Cracking the shell: Balut revealed | Tangled Noodle". tanglednoodle.blogspot.ca. March 13, 2011. Retrieved August 15, 2016. 1 2 3 "Course:FNH200/Lesson 02 - UBC Wiki". wiki.ubc.ca. Retrieved March 21, 2016. 1 2 3 R. Ehrlich, Paul. "Incubation: Heating Egg." Incubation: Heating Egg. Web. February 29, 2016. 1 2 "Redirecting...". drive.google.com. Retrieved March 17, 2016. ↑ "What Is a Balut Egg?" What Is a Balut Egg? SF Gate, n.d. Web. February 25, 2016. ↑ BBC. "Cooking and Chemical Changes." BBC News. BBC, n.d. Web. February 29, 2016. 1 2 Kaewmanee, Thammarat. "Changes in Chemical Composition, Physical Properties and Microstructure of Duck Egg as Influenced by Salting." Research Gate. N.p., 11 June 2008. Web. February 29, 2016. ↑ Lambio, A. L. (2010). Poultry Production in the Tropics. Quezon, Diliman, Philippines: The University of Philippines Press. ↑ "What Is a Balut Egg?". The San Francisco Chronicle. 1 2 "In Some Countries People Eat Balut(egg) fertilized duck embryo". 2012. Retrieved August 16, 2016. ↑ "Best balut in Vancouver. (n.d.)". Retrieved August 16, 2016. 1 2 Emily Liedel (April 14, 2014). "Balut: The Fertilized Duck Egg Street Snack - Modern Farmer". Retrieved August 16, 2016. 1 2 "Enhancing the value of eggs: How to make balut and century eggs". www.fftc.agnet.org. Retrieved August 15, 2016. ↑ "Balut" (PDF). North Bay Perry Sound District Health Unit. University of Guelph. February 11, 2009. Retrieved March 4, 2016. ↑ Guelph, University (March 3, 2016). "Balut" (PDF). CPHAZ. Retrieved August 15, 2016. 1 2 "Is eating egg haram / makruh - Multaqa Ahl al-Hadeeth". August 28, 2011. Retrieved August 16, 2016. ↑ Tang, Q., Li-Chan, E. C. Y., Byrne, S. K., & Cheng, K. M. (n.d.). Effect of storage temperature on sensory and microbiological quality of duck balut eggs, 4. ↑ Nutrition, Center for Food Safety and Applied. "Food Code - FDA Food Code 2009: Annex 3 - Public Health Reasons / Administrative Guidelines - Chapter 1, Purpose and Definitions". www.fda.gov. Retrieved March 20, 2016. 1 2 Kilham, Chris (September 15, 2011). "Eating Balut: Going Too Far? | Fox News". Fox News. Retrieved August 15, 2016. ↑ Leary, S.; et al. (2013). "AVMA Guidelines for the Euthanasia of Animals - 2013 edition" (PDF). AVMA. Retrieved March 24, 2016. ↑ "Consolidated version of ASPA 1986". Home Office (UK). 2014. Retrieved March 24, 2016. ↑ "Is the practice of boiling pre-hatched duck embryos in their shell humane?". RSPCA Australia knowledgebase. Retrieved 10 October 2016. ↑ Matejowsky, T. (2013). The Incredible, Edible Balut. Food, Culture and Society: An International Journal of Multidisciplinary Research, 16(3), 387-404. ↑ San Jose, C.E. (April 13, 2015). "Animal rights activist: Stop serving 'balut' in New York". Kicker Daily News. Retrieved March 20, 2016. ↑ Calderon, J. (2014). "Balut: The Filipino delicacy that makes the world squirm". CNN. Retrieved March 24, 2016. 1 2 Information Sheet (2011). "Balut" (PDF). University of Guelph. Retrieved March 24, 2016. ↑ "Balut gets spotlight in New York". ↑ "Episode No. 8 recap: "The Ultimate Fighter: Team Nogueira vs. Team Mir"". Davidson, Alan (1999). "Balut". Oxford Companion to Food. Oxford University Press. p. 53. ISBN 0-19-211579-0. 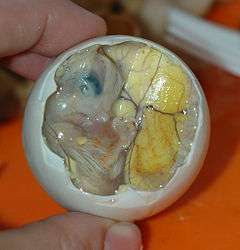 Wikimedia Commons has media related to Balut.